We have to confess that we are jealous of the community out in Belmont Shore in Long Beach. Why is that? Well, they've got Brix at The Shore. Granted, the restaurant is not too far from where we reside but to have the best pastrami so close to you must be a treat. This spot is not only where we've had the best pastrami we've had but also a local favorite for its wine and craft beer selection. The 65 seats fill up quickly during their lunch, dinner, and brunch services as people flock to the relaxed, quality environment owner Rick Reich has put together. 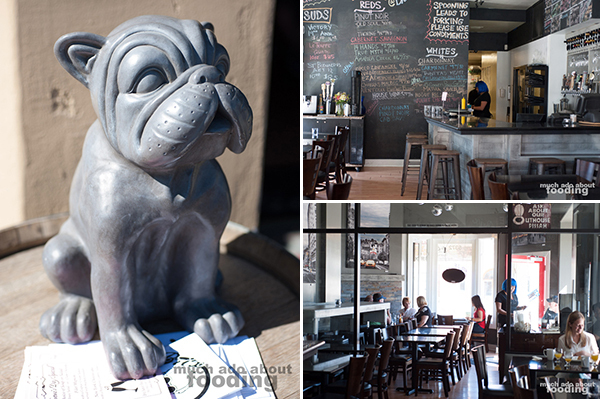 It attracts guests of various ages with the great food, personable staff, and welcoming atmosphere. When we got word of the accolades that Brix at The Shore has received for their pastrami (among other things), we were ready to get over there and visited through an invitation. The first impression when you stroll into Brix is how open to conversation the layout is. A main feature inside is their 16-seat black granite bar which gives guests plenty of space to themselves or to chat with each other. Tributes to New York delis are found all along the walls via black and white New York City photographs and paintings. A tall chalkboard in the back lays out the libations for the day alongside some tongue-in-cheek wit. What you might not know upon first glance too though is that the owner, Rick, doubles as the restaurant's sommelier, a title not to be taken lightly as he stands as a second level advanced sommelier with plans on achieving Master status. The restaurant caters to wine lovers but not, as he puts it, wine snobs. The selection is great but the approach contains no air of stuffiness or superiority which we, and I'm sure many guests, appreciate. "Most importantly, I believe in W-I-N-O, that is Wine Is Not Ostentatious. It's a liquid that gets you high so let's not get carried away; it's about fun, and the world has a lot more to offer than California wines." Not only are the wines impressive but the beer selection also features some fabulous choices. Reich emphasized that for both cases, the conversation that happens is the most important part of the process. Their menu does not list the beer type (IPA, wheat ale, etc) because it is about exploration and finding what you like outside of what you think you know. He'll pick the beers to go onto the menu based on filling in the gaps with food and region and particularly enjoys being one of the first to carry one. For example, making sure there is always a German hefeweizen on tap is necessary, and it isn't uncommon to find beers from Belgium and the Czech Republic. The Sunset Beach location of Brix is much more tuned into these choices and rotates 10-15 titles a week due to demand. "When is the last time you saw a smile in your wine? Wine is supposed to give you that experience but most people don't know what they like. When they come hugging me at the end of it all after I've paired them, it's a success!" So that's their approach to their drink program but what about the food? Reich grew up in New York and frequented several delis and restaurants with his family over the years. 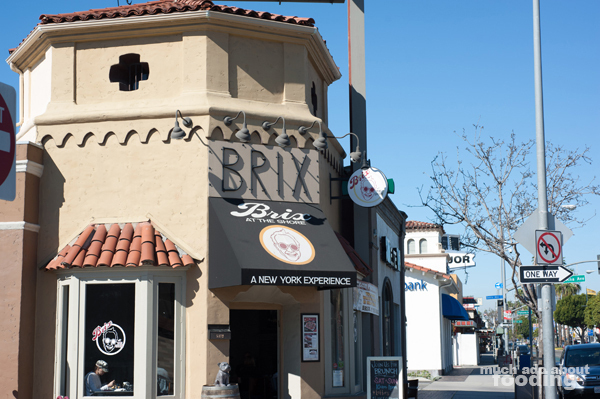 It was his goal to bring that flavor and style over to the West coast through Brix. Their menu has several staples of sandwiches and burgers that you'd find in an NY deli but it also has flatbreads (a mix of NY pizza and CA style toppings), salads, and a brunch with classic Jewish dish favorites like their popular Chutzpah. They also take great pride in their bagels which are "as close to New York as you can get without the weather." Our start with the menu was with their appetizers. 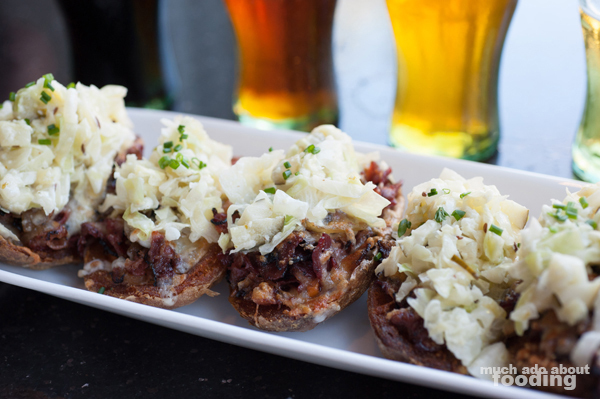 The first out were the savory Pastrami Skins ($12 for 4 pieces - potato skins loaded with Brix Deli Sauce, pastrami, grilled onion, melted Swiss, and coleslaw), boats of deliciousness fully mounded with the highly-praised pastrami and plenty of other rich tastes. The grilled onion gives some sweetness to the entire bite but the pastrami really makes the difference here. We also enjoyed how crisp the skins got without being detrimental to the softness of the potato meat itself. 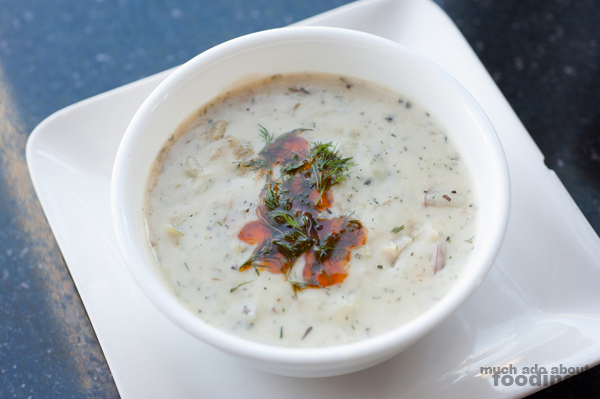 Next was a generous cup of their infamous Clam Chowda ($4.50/$8 - loads of herbs and spices), a unique version of the soup which included Chardonnay, dill, tarragon, and habanero chile oil on top. The buttery Chardonnay in the soup was highlighted by the dill, and the extra spicy kick from drizzled oil on top was a nice touch. The recipe itself came from the chef's grandmother and was such a hit when introduced that all other soup offerings were removed from the menu. We enjoyed how thick and comforting the soup was along with the unique flavors brought in from the extra herbs and spices. Though there is a chef in the kitchen working, the dishes originate from Reich himself aside from the occasional one contributed by others such as the soup. How he puts together the food is on the philosophy of "one and one equals ten," which focuses on bringing elements to the food that turns two (or more) simple, basic items into powerhouses when combined. 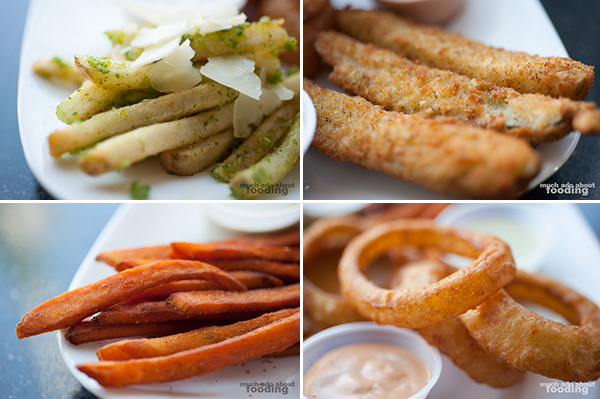 We saw this next with a platter of their typical starters/sides which consisted of Garfunkle Fries ($6.50 - basket of fries tossed in garlic-jalapeno-cilantro blend topped with shaved Parmesan and served with Ranch), Trigger Fingers ($5 for 5 pieces - deep-fried pickle spears served with Ranch), Simon's Sweet Potatoes Fries ($6.50 - basket of sweet potato fries in a sweet spiced sprinkle served with creamy cilantro aioli), and Oy Vey! 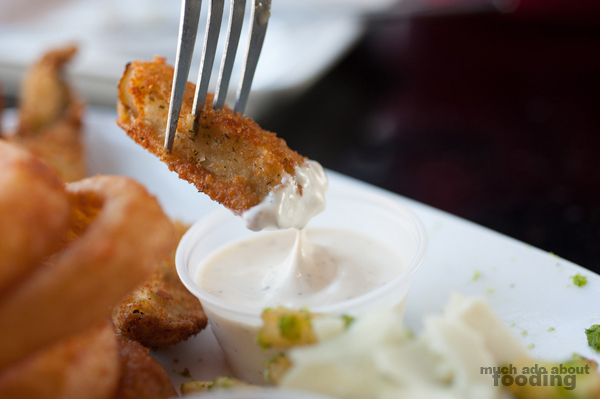 Onion Rings ($6.50 - basket of beer-battered rings in a spicy sprinkle served with chipotle aioli). 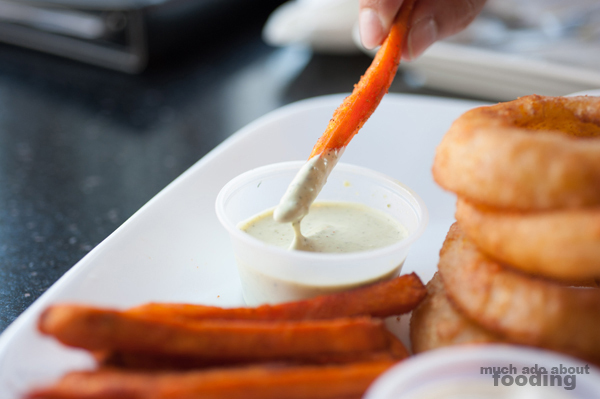 With each, there was a component that would take it a little further than expected whether it was the subtle jalapeno on the fries or the dill in the pickle spear batter. 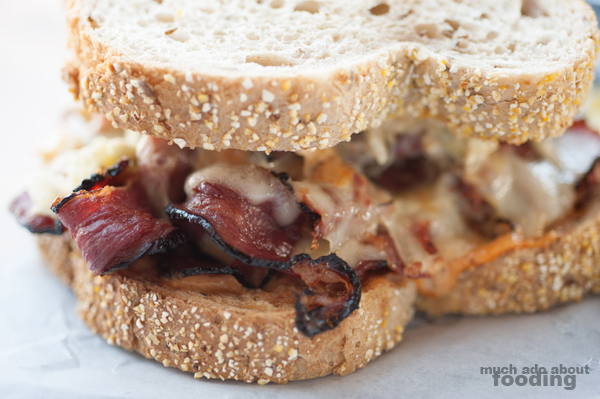 "I believe I have the world's greatest pastrami, and I hear it all the time too. When I was a kid, I used to watch pastrami get steamed and would look up, thinking there was more flavor in the ceiling than the pastrami! 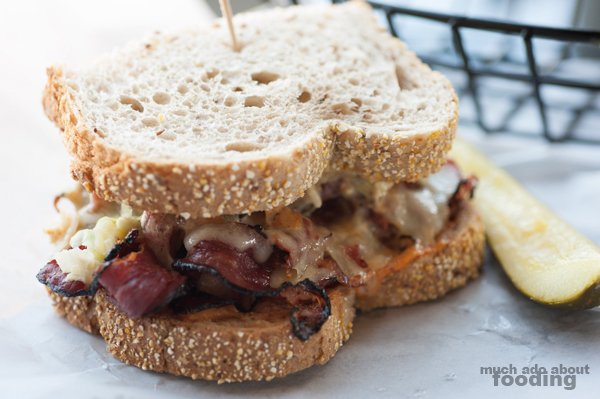 We've figured out here how to caramelize the pastrami and keep in the flavor." The star of Brix at The Shore is their Fuhgeddaboudit. Reich knew exactly what the end product would be before he started the restaurant and just had to put it all together. The sandwich comes in various sizes too for the customer ranging from half to full to fuller! This pastrami sandwich is listed as the Fuhgeddaboudit ($8.50/$11.50/$15 - warm pastrami, Brix Deli Sauce, melted Swiss, and house coleslaw on lightly toasted rye bread) and was easily the best pastrami we've had so far. Smoky and savory, the meat was perfectly thin and full of flavor with a slight crisp along the edges. There was plenty of crunch from the coleslaw as well despite a slathering of melted Swiss and sauce. The slight toast on the inner side of the rye bread stopped the sandwich from getting soggy, a smart move to pay attention to the details. We really enjoyed the heftiness of the Fuhgeddaboudit overall as well with generous serving of the pastrami creating a high stack hard to put your mouth around! We also gave one of their burgers a try, specifically because there was a story attached to it. 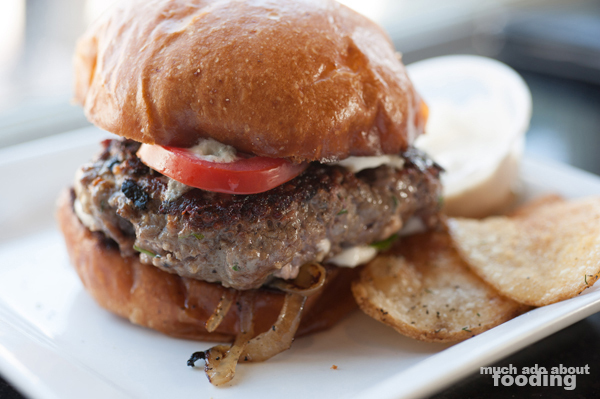 Their patties are made with short rib, tri-tip, and brisket which makes for an uncommon texture. We chose the Ol' Blue Eyes ($12 - 8oz Angus infused with mushrooms and Bleu cheese topped with spinach, tomato, grilled onion, and mayonnaise) which Reich explained originated on a George Foreman Grill when a supplier of cooking dropped out on them. To achieve the flavors, he had to stuff the mushrooms and cheese inside the patty and thus the delectable burger was born. This is certainly one for the Bleu cheese lover as every bite smothers your mouth with the cheese. It seeps through with the natural oils of the patty and not only is the scent strong but so is the taste. The fat burger is no joke! So what else is in the future for Brix? Perhaps a combination matzo ball French onion soup, Reich shared. Other than that, they will keep doing what they do best: churning out a favorite place to hang out that features disco music in the daytime, big bad voodoo daddy/swing music at night, and a medley of delicious foods all the time. They are located at 5362 E. Second Street in Long Beach.